The DK DIN bite type tube fitting is a flareless metric fitting that consists of a body, a progressive ring (sleeve) and a nut. On assembly, two cutting edges of the progressive ring bite into the outer surface of the tube ensuring the holding for high Tube pressure. Available in three series, DK DIN bite type tube fittings and accessories are manufactured in accordance with DIN2353/DIN EN ISO8434-1. 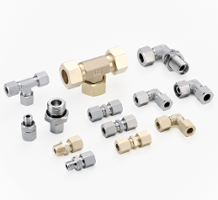 DK DIN bite type tube fitting produces a low to high pressure, leak free connection of tubes and components in fluid systems. The basic function of the DK DIN bite type tube fitting is the controlled progressive bite of the ring (sleeve) into the tube due to a unique internal geometry.